This retreat is suitable for students who are have a good level of fitness and an intermediate level of yoga practice, 18months plus. Covering the intermediate syllabus. To include daily pranayama. Taught by Lin Craddock senior Iyengar yoga teacher. Quinta Mimosa is a 5-hectare property in the centre of Algarve, surrounded by gardens and orchards. The Centre is located 20 minutes away from Faro airport and 15 minutes away from the coast and some of the most beautiful beaches around here (Ancão, Garrão, Vale de Lobo and Quinta do Lago). 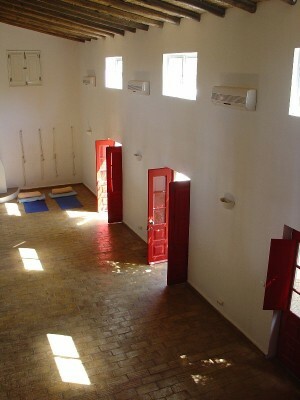 The fully equipped yoga studio is light and airy, kept cool from its pretty shaded terrace . The accommodation varies from independent cottages located within the grounds with available double rooms with bathroom, single occupancy is also possible and there is also a dorm room for 4 people. Flights to Faro – Easyjet, Ryanair and British airways all fly directly to Faro. 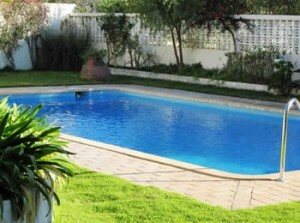 Quinta Mimosa is situated just 20 minutes taxi/car ride from Faro Airport. Taxi transfers from Faro to Quinta Mimosa cost around €25-30 each way.